Interdisciplinary Minors complement majors by allowing students to explore an interest as well as delve further into broader subject matter. For example, minors that would complement a Women and Gender Studies major who wants to work in community outreach for women's shelters might choose Leadership, Justice and Peace Studies, or Pre-Law. The Catholic Studies Minor at St. Ambrose University is an interdisciplinary program of study designed to offer the students an exploration of Catholic intellectual tradition. The goal is to gather students and faculty from all disciplines to engage in a critical, sympathetic investigation of Catholic thought and life. Catholicism is complex; it is a faith tradition that incorporates doctrines, structures, rituals, customs, philosophical thought, sociological phenomena, and artistic secular, and therefore it is ﬁtting that such a process of inquiry take place at a university setting. 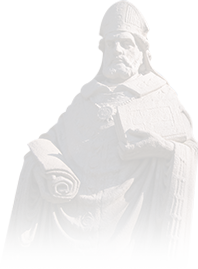 Another advantage of learning Catholic Studies at SAU is our very own Academy for the Study of Saint Ambrose of Milan which promotes scholarship, research and creative work about our patron saint. Gaining Admittance – Contact your advisor or the program director. Choose one section (A-D) below. Within each section, 3 credits each must come from: Theology; in a field other than Theology; and a 300 level course or higher. • Further course suggestions include: ENG 120 Catholic Literature; PHIL 343 Peace & Non-Violence; THEO 312 Interdisciplinary Seminar in Peace & Justice; MUS 310 Music in Liturgy; or an appropriate course among the electives listed above. • Further course suggestions include: SOC 336 Death & Dying; THEO 301 Prayer, Spirituality, and Liturgy; SOC 356 Sociology of Religion; or an appropriate course among the electives listed above. The Classical Studies Minor at St. Ambrose allows students with an interest in ancient Greek and Roman cultures to pursue extended study of various aspects of those cultures and gain an appreciation of the relevance of classical culture to their own lives. The minor supports various majors, including History, Philosophy, Theology, and Political Science. Approval and planning a course of study with an advisor and the program director in History is required. AH 130 or CSM 101; AH 250 or HIST 215; LAT 101, 102; PHIL 217. Choose one course from the following: AH 323, 324; HIST 102, 321, 322; THEO 141, 202, 344. This experience consists of a presentation, paper, exhibit or other experience as approved by the CSM Director. Usually, students presenting Capstones will do so through their major departments and the topics are linked to their major; topic and product must be approved by the CSM director. The goal is for the student to reflect on the linked courses and demonstrate their understanding of the Classical ideas, content, and skills from these courses. The linked courses should allow students to develop the knowledge and skills necessary to achieve the Capstone. This program challenges students to explore our physical environment from various perspectives, from literature to theology, and biology to sociology. Through the successful completion of this interdisciplinary minor, students will learn diverse approaches to understand, relate to, and responsibly manage non-human nature. The coursework supports a scientific understanding of ecosystems; a philosophical, theological, artistic and literary basis for relating to the environment; socio-political, economic and historical contexts; and hands-on experience in conservation, preservation, and restoration. Gaining Admittance: You and your advisor need to consult with Program Coordinator Rev. Robert Grant. Students must earn a grade of C or better in all required courses in order to receive credit toward the minor. or other courses approved by the chair of the department. The Hispanic Studies minor is interdisciplinary. Its primary purpose is to promote biculturalism and prepare students to enter an interconnected, globalized world. The curriculum helps students to develop linguistic and cultural skills in order to enrich their own lives and the lives of others. Foreign Language proficiency through Foreign Language 102 is required. Available to any major, the Justice and Peace Studies minor provides an interdisciplinary academic focus on issues of social justice, with a special emphasis on peace, non-violence and conflict resolution. In the Ambrose tradition of concern for dignity of all persons, social justice and respect for diversity, a variety of academic and co-curricular opportunities exist for students to enrich their education by exploring issues of justice and peace. The minor is sponsored jointly by the Theology and Philosophy departments but maintains an interdisciplinary focus. Approval and planning a course of study with the student's academic advisor and the JPS program director is required. *Students can use Mediation training to fulfill part of the Practicum requirement. Mediation training is not required, but the Practicum course is a requirement. Students should meet with the JPS program director and their academic advisor to prepare a curriculum plan that combines their academic, professional and research interests. The interdisciplinary minor in Leadership enhances the practical and analytical skills of students interested in leadership development. The minor challenges students to think critically and build on their ability to act as knowledgeable, ethical, and caring leaders in the diverse world in which we live including business, government, community service, and civic engagement. The mission of the minor is fulfilled through a curriculum that assesses the theories and practices of leadership; applies the theory and practice of leadership to private, public, and non-profit situations; and assists students in developing their leadership potential. Entry procedure: Approval and planning a course of study with an advisor and the program director in Political Science. The Interdisciplinary Minor in Pre-Law is for students interested in studying law. It has a threefold mission. First, it seeks to encourage sustained reflection upon the relationship between law and human nature. Second, it seeks to give students a practical introduction to the basic elements of the American legal system, as well as other legal systems, and the history of legal thought and practice. Third, it seeks to provide students with the background and skills necessary for success in law school and in the field of law. Special attention will be given to logical and critical thinking, persuasive argument, and cogent speaking and writing. Entry Procedure for an Interdisciplinary Minor in Pre-Law Studies: Approval and planning a course of study with an advisor and the program director in Political Science is required. Students may not count more than 12 hours of Political Science toward the minor. 9 hours must be from approved General Education courses. WI-PSCI 400, or capstone in major with permission. Available to students in any major, the Women and Gender Studies minor provides an interdisciplinary academic focus on issues of women and gender. In the Ambrose tradition of concern for social justice and respect for difference, a variety of opportunities are available for students to enrich their education by exploring women's heritage of achievements and the changing roles of women and men. Entry procedure: Approval and planning a course of study with an advisor and WGS program director is required.